Photo's taken by Paige Young. Jumper, jacket & chain: Primark. Trousers and boots: Topshop. Bag: Zara. 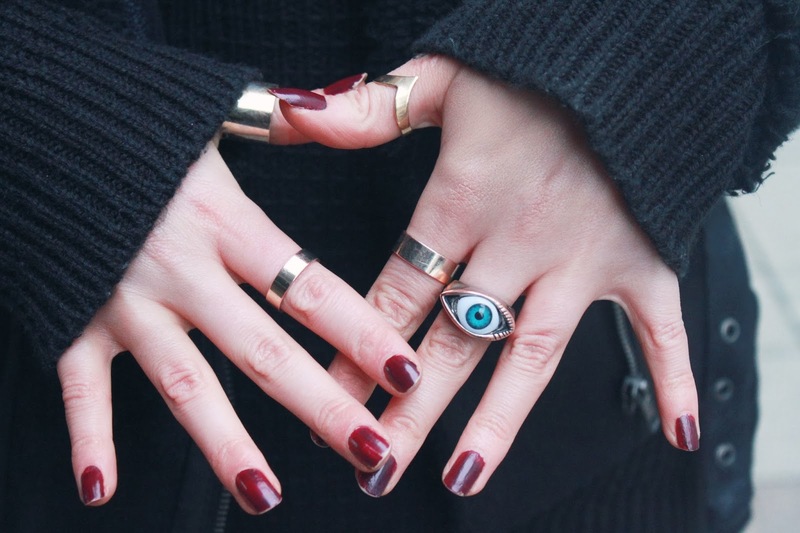 Band rings: h&m. I'm so grateful that I was contacted by Paige who asked if I wanted some outfit photo's taken while I was up in Nottingham for a few days. I think everyone has been a sucker for tartan during these winter months, it's been perfect. The shoot was very unexpected and I had to wear only the things I brought up to Nottingham with me, so here we have my deep green tartan trousers which I am currently in love with, paired with lots of black. My jumper was also a £3 bargain which I am also living in. Argh once again this was pretty unexpected therefore my nails are horrendous and does not do any justice to Topshop's matte nail varnish in shade wine. But excusing my poor nail skills, how good are the photos? Huge thanks to Paige for finally getting my blog looking more fresh and I was so happy that she was so lovely and easy to work with. Feel free to check Paige's blog out, http://echoesinyourheart.blogspot.co.uk/, I'm completely in love with her style. another cute blue/green tartan style ! Lovely ! Love both of the tartan trousers!